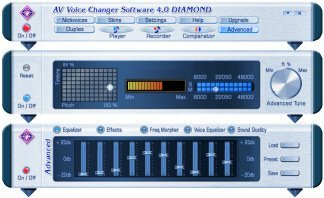 Voice Changer Software from http://www.audio4fun.com/ is a voice alteration program that may bring lots of fun if is used in addition to a chat or VoIP software. It lets you tweak your speaking voice in real time by adding echos and other sound effects. You can download a trial version from the web site and if you like it you can purchase it. To maximize the fun and help those with no technical audio knowledge the software comes already packed with several alteration presents tuned for both male and female voices. You can use this application with virtually any chat or VoIP client.